We are pleased to announce the closing of another New York city brownstone at 41 West 84th Street where we represented the buyer and the seller. One of the joys of owning an Upper West Side townhouse is the rare opportunity to live a life of modern convenience amid the elegant surroundings of the past. 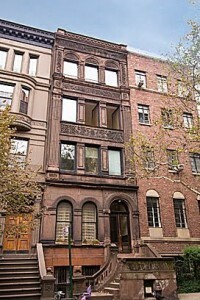 This 1883 townhouse provides the best of both the past and the present – it not only preserves but also rejuvenates the Old New York familiar to Edith Wharton and Teddy Roosevelt. Original mahogany woodwork, original pocket doors, and a striking original staircase have preserved the charm of that Gilded Age. Extraordinarily high ceilings and original parquet floors throughout most of the parlour level and much of the third floor, as well as colorfully detailed decorative fireplaces in almost every room in the house, will assure that your twenty-first century life is constantly nourished by belle époque beauty. At the same time, the old-fashioned elegance of this Manhattan townhouse is made exceptionally livable by modern architectural innovations. The extension has an almost completely glass rear wall that affords lush arboreal views from all five floors. A rear terrace, a wooden roof deck, and two greenhouse spaces provide the natural light and fresh air demanded by today’s architectural tastes.